Speed awareness courses provided more than 23m to 20 police force areas in England in one year, the BBC has learned. Official figures show the number of drivers taking the courses increased 26.5% in that time. Amounts charged vary as the courses are run by private companies. Senior police officers claimed forces make no money from the courses and the fees only cover the cost of enforcement. 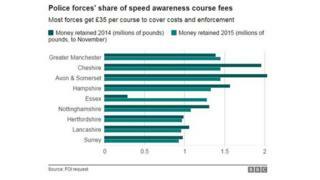 Most forces keep about 35 of the fee – between 79.50 and 92.50 in total – depending on area and course provider, or it goes to road safety partnerships they run with councils. 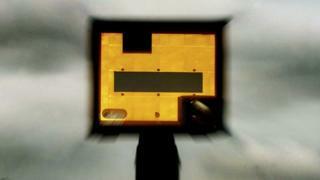 The money is to cover the costs of catching speeding motorists and processing offences. Drivers can choose to take a course instead of receiving points on their licences, which can contribute to an eventual ban for repeated offences. There was a 26.5% rise in drivers taking the course between 2013 and 2014. In 2014, the last full year for which data is available, the 20 forces that responded in full to requests for information, out of 39 in England, retained 23.1m compared with 19.7m the year before – a rise of 17%. For 2015, the figure was 18.3m up to the end of November, the time of asking, but does not take into account any income processed since then. 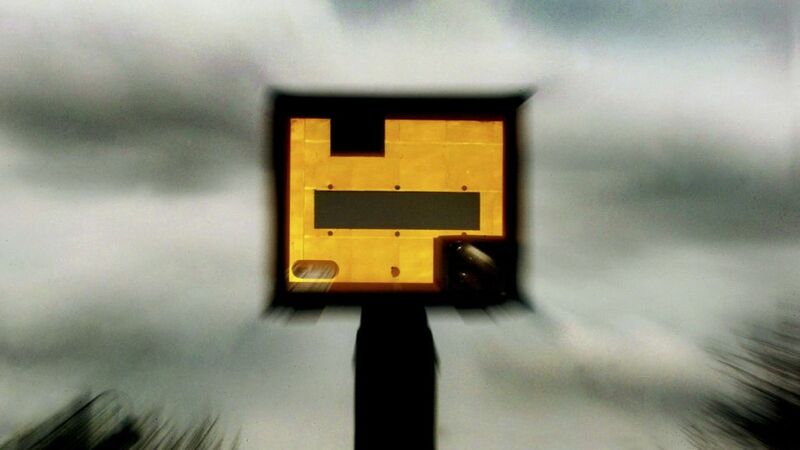 Over the 20 forces, 995,541 drivers were caught speeding in 2013, rising to 1.1 million the following year. By November 2015, more than 1 million drivers had already been caught. Greater Manchester Police retained about 1.45m up to November 2015, compared with 1.39m for the whole of 2014. The largest force in England, the Metropolitan Police, did not hold all the information requested, while West Midlands Police, the second largest, has not responded to a request under the Freedom of Information Act. In Bedfordshire, where police and crime commissioner Olly Martins believes turning on M1 speed cameras permanently will generate millions of pounds for the force, the number of people sent on awareness courses almost doubled in one year. There were 20,562 courses completed in 2014 compared with 11,132 the year before. The force would not reveal its figures for 2015 at the time of asking. Speed awareness courses, as well as other training alternatives to fines for offences such as not wearing a seat belt, are overseen by the not-for-profit National Driver Retraining Scheme (NDORS). Figures show the total number of drivers taking courses across the UK has risen from 467,601 in 2010 to 1,355,796 in 2014, the last year for which data is available. It says the increase in some cases is “due to the fact that not all courses were available in all police forces”. Motoring research charity the RAC Foundation said there was not a clear picture as to whether the courses cut re-offending. Director Steve Gooding said: “Intuitively, education seems a better option than penalising drivers for what, in many cases, are minor transgressions. National Police Chiefs’ Council lead for roads policing, Chief Constable Suzette Davenport, said: “Driver retraining courses have been well received by motorists and contribute to reducing deaths and casualties on our roads.